In recent versions of popular browsers there is a convenient option – visual bookmark. Their number is set by the developer does not always satisfy the user. In some browsers the number of visual bookmarks you can increase. Let's see how to do it. In Opera visual bookmarks are called "speed dial". To increase the number of tabs on it, click on the page "Express-bar", right-click and select "Configure speed dial". Set "Number of columns" value "Column 7", and for "Scaling" the value "Automatically". Now, when you add a new bookmark in the "Express-bar", it will automatically expand, and the number of bookmarks increase. If you use Google Chrome, then in order to remove the limit of 8 tabs by default, have to install the extension Speddial. To do this, click on the wrench icon to get the menu, then go to "Tools" - "Extensions" and click the link "extensions". In the search field, enter the Speeddial, and when the extension is found, install it. Opening a new tab, you will find a new page of visual bookmarks. Clicking on the Options button, you can set up to 81 visual bookmark. 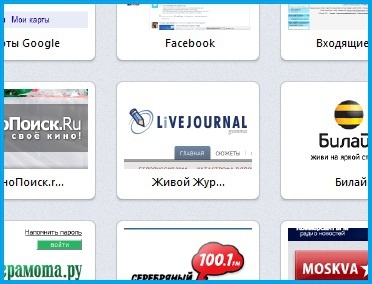 To increase the number of visual bookmarks in Mozilla Firefox, open the menu and go to "add-on". Search for Fast dial, and set the found addition. Restart the browser and click the "Setup" of this Supplement. Install the required number of visual bookmarks and then close the settings menu additions. Using the Supplement Fast Dial you can set a nearly unlimited number of bookmarks. 1. Open the menu ”help > About” and see the path to the folder with the profile. 2. To Close Opera. 3. In the profile folder find the file speeddial.ini. 4. To open it in a text editor and add the following lines: [Size] Rows=5. 1. Open the menu ”help > About” and see the path to the folder with the profile. In Opera 10 - click on "Configure speed dial" in the bottom corner.